The consul Publius Cornelius Scipio Nasica wins a decisive victory over the Boii, who finally surrender. Half of their lands are confiscated and become Roman public land. Even before they learned of King Antiochos’ invasion of Greece, the Romans had begun to prepare for war. The incumbent consul Lucius Quinctius Flamininus had been instructed to recruit new legionaries and allies for his successor’s army. Since the Roman calendar of those days was way ahead of our modern calendar, the new consuls had taken up their offices on 6 November of the previous year (15 March according to the Roman calendar). Their names were Publius Cornelius Scipio Nasica (who had been unsuccessful during last year’s elections) and Manius Acilius Glabrio. The consuls drew lots and Glabrio was granted the war against Antiochos as his province. Scipio Nasica would stay behind in Italy for operations against the Boii. The consul Glabrio lost little time and hurried to Brundisium with his army to sail to Greece. The attack on the Roman soldiers at Delion had given the Romans a casus belli and war was declared on the Seleucids soon after. The Romans would teach King Antiochos a lesson he would remember. The Romans had every reason to believe that this war would be over quickly. Their allies in the region were strong and unwavering in their loyalty. The Achaean League was at the height of its power, and Rome could count on the armies and fleets of Rhodos and Pergamum as well. King Ptolemaios of Egypt and King Philippos of Macedonia offered money, troops and grain, but the Romans felt strong enough to kindly thank both kings for their generosity and then turn down their offers. The Carthaginians and Numidians sent large supplies of wheat and barley to Greece, for which the Romans duly paid. In addition, King Masinissa provided the consul Glabrio with 500 horsemen and 20 war elephants for his army, while the Carthaginians sent a few ships to be added to the Roman fleet. Carthage had by now completely recovered from the Second Punic War and even offered to pay the remaining instalments of the indemnity all at once. The Romans, however, refused and wanted to stick to the agreement that the sum was to be paid over a period of 50 years. Antiochos, on the other hand, had so far only managed to secure a few insignificant alliances. King Amynandros of the Athamanes was now on his side, but the king was a non-entity. The rout of the small Roman force at Delion had caused the Boeotians to defect, but they were hardly able to put an army in the field because of the severe socioeconomic crisis in their region. Messene and Elis on the Peloponnesos sympathised with the Aetolians and were traditional enemies of the Achaean League. 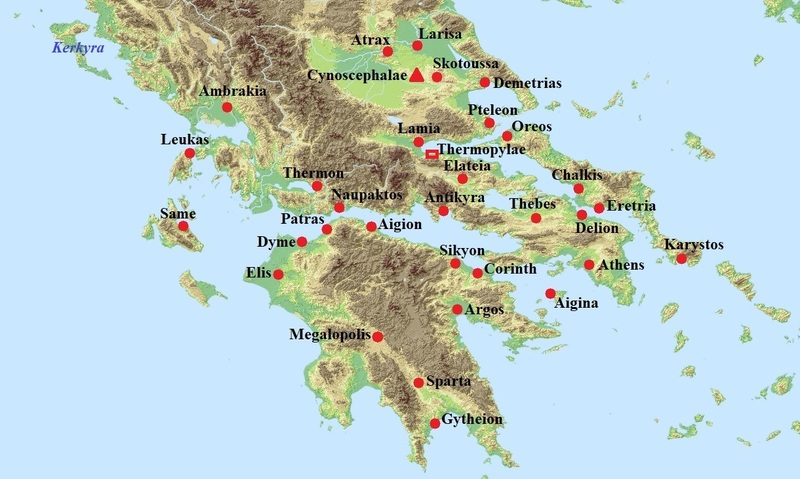 These cities were potential allies for Antiochos, but militarily they were very weak. The king for the moment had to rely on the army of the Aetolian League, which on paper outnumbered his own forces, but was spread out over a large area. So in sum, the king desperately needed new allies to provide him with extra troops. Livius claims that it was Hannibal who advised the king to try and forge an alliance with King Philippos of Macedonia. This advice made sense, as Antiochos and Philippos had been allies in the past. Antiochos now tried to create some goodwill with the Macedonians by travelling to Cynoscephalae, collecting the bones of the Macedonians who had fallen there and had not yet been buried, and erecting a magnificent funerary monument. The gesture was not appreciated by Philippos, who renewed his allegiance to Rome in a meeting with the praetor Baebius. The winter must have been fairly soft this year, as Antiochos decided to invade Thessaly in January. After capturing several minor cities, the king attacked the important stronghold of Larisa. The praetor Baebius sent ahead one of his legates with a small force to relieve the city. The legate commanded just 2.000 men, and this force would surely be no match for the king’s army if it came to a fight. However, the legate cleverly constructed a much larger camp than was required for his army and also lit a much larger number of fires. Antiochos was deceived and believed that the Romans’ main army had arrived. Using bad weather as a pretext, the king gave up the siege of Larisa and retired to Demetrias and then to Chalkis. There he fell in love with a local girl named Chalkidike. He married her and spent the rest of the winter feasting, drinking and sleeping. It should be clear that by doing this, the king lost valuable time. During the winter, presumably in January, Manius Acilius Glabrio had landed at Apollonia with an army of 20.000 infantry, 2.000 cavalry and some 15 war elephants provided by the Numidians (note that our sources differ as regards the size of the Roman army; King Masinissa had actually sent 20 elephants – see above). The consul quickly marched to Macedonia and then swung south towards Larisa. In the meantime, the praetor Baebius and King Philippos had already invaded Thessaly and had brought the weak Athamanes to their knees. Philippos of Megalopolis, the man who believed that he had a right to throne of Macedonia and that the other Philippos was a usurper, was captured and sent to Rome as a prisoner. His brother-in-law King Amynandros had no option but to flee to Ambrakia with his wife and children. The consul then took charge of affairs and recaptured all of the cities that had previously fallen to Antiochos. He subsequently reached Thaumakos, a member of the Aetolian League. The inhabitants foolishly tried to attack the Roman column, but Glabrio sent a tribune with two maniples around their line to cut off their retreat. These men captured the undefended city. Having nowhere to flee to, the attackers were trapped in a baguette of death and cut to pieces. 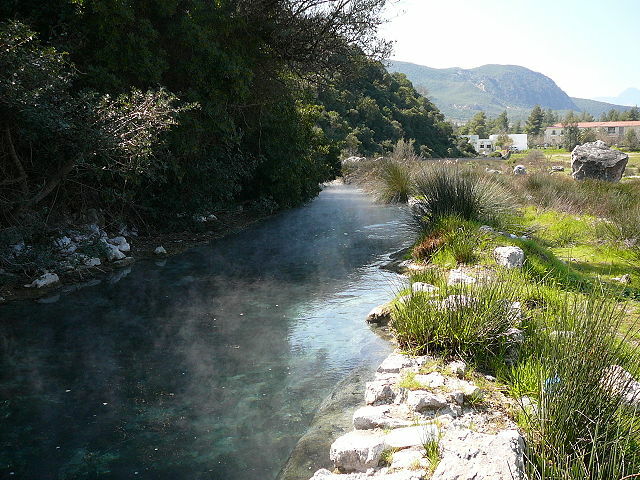 The hot springs from which Thermopylae takes its name (photo: Fkerasar, GFDL/CC BY-SA 3.0 license). Antiochos had been in Akarnania to win over the Akarnanians. When a Roman fleet appeared near Leukas, the king realised that the season was now favourable for sailing and that the consul Glabrio and his army had most likely already landed in Greece. The king immediately returned to Chalkis. He was in a difficult position. Very few reinforcements had arrived from Asia, and his army was no larger than it had been the previous year. With just 10.000 infantry, 500 cavalry and a handful of elephants, it would be impossible to defeat Glabrio’s army, which was more than twice as large. Antiochos therefore decided to make his stand at a historic location, the narrow pass of Thermopylae. In 480 BCE, King Leonidas of Sparta had held out here for three days with a much smaller force against the immense army of the Persian King Xerxes. A narrow pass was an excellent battlefield for Antiochos’ pike phalanx. It would be almost impossible to flank the phalanx in such a confined space. The king ordered his men to reinforce their position with walls, ramparts and moats. A frontal assault on this position would be tantamount to suicide. It was now April, and Glabrio needed to find a way to get around the Seleucid position. On either side of the pass were peaks, named the Tichios, the Rhoduntia and the Kallidromos respectively. These had been occupied by Aetolian troops. Their positions were on rocky terrain and therefore difficult to assault, but the consul decided to try it anyway. The legates Marcus Porcius Cato and Lucius Valerius Flaccus – the consuls of 195 BCE – were sent up the peaks with a picked force. Flaccus’ attack on the Tichios and the Rhoduntia was a failure, but Cato managed to catch the Aetolians on the Kallidromos by surprise. Even though most of them had been asleep, there was still some fierce fighting before the Aetolians fled. Meanwhile, the consul had begun the attack in the pass of Thermopylae. His experienced troops pushed back the Seleucid peltasts, but were then halted by the long pikes of the phalanx. The pikemen were fighting from an elevated position – the Seleucid rampart – and the consul would have suffered serious losses, had not Cato suddenly appeared on the Kallidromos above the Seleucid camp, driving the Aetolians down into the pass. 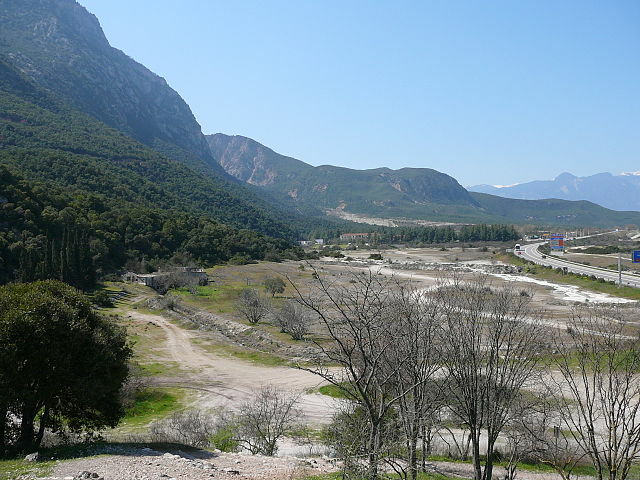 The pass of Thermopylae (photo: Fkerasar, GFDL/CC BY-SA 3.0 license). The Seleucids at first thought that reinforcements had arrived, but then realised it was Cato who was threatening their flank. The legate’s force was not very large, but the imminent attack from two sides caused the Seleucid infantry to panic. The pikemen and the other troops tried to flee back to their camp, but the Romans were hot on their tail. Most of the Seleucid foot soldiers, some 10.000 in total, were either killed or captured. The Romans themselves lost just 150 men during the battle, at least according to Livius and Appianus. 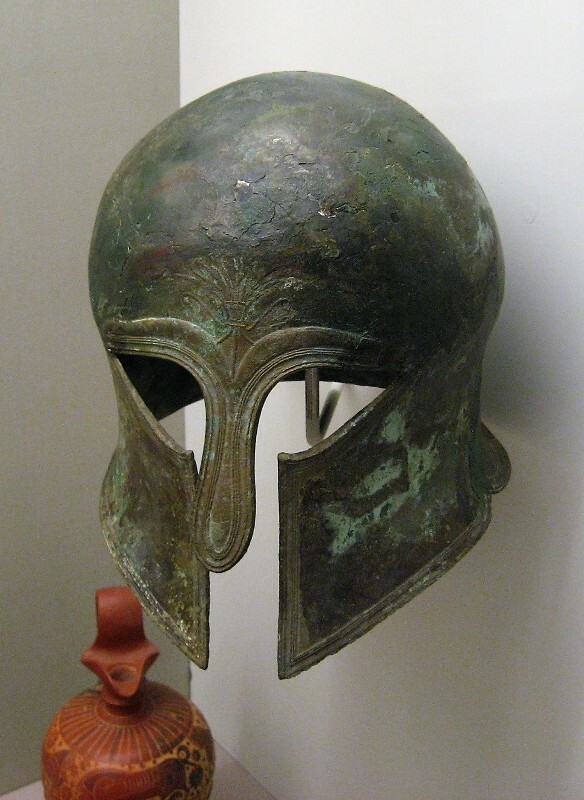 50 more were killed when Aetolian troops from Herakleia attacked the Roman camp, but failed to take it. Actual Roman casualties may have been higher that day, but there could be no doubt that the Battle of Thermopylae was a decisive Roman victory. Antiochos managed to save his skin by fleeing to Chalkis with just 500 men, presumably his cavalry. There he embarked on a ship and sailed back to Ephesos with his bride. The consul now easily recaptured Chalkis, causing the other Euboean cities to surrender. Glabrio decided to be mild and spared them all. He then sent Cato back to Rome to report about the Roman victory. Antiochos’ departure from Greece left the Aetolians in an isolated position. Not only were they now facing the might of Rome, they also suffered attacks from their traditional enemy, King Philippos of Macedonia. Glabrio first attacked the city of Herakleia, a Spartan colony and a member of the Aetolian League. The Romans took the city after a siege of 24 days and some particularly fierce fighting. After they had taken the city, they thoroughly looted it and carried away rich spoils of war. The Aetolian commander Damokritos was taken prisoner. The Romans held a grudge against him because he had insulted Titus Flamininus. When the latter had asked for a copy of the Aetolian decree inviting Antiochos to liberate Greece, Damokritos had answered that he would present him with a copy on the banks of the Tiber. The Aetolian now paid dearly for his arrogance. The Romans needed to walk a fine line in Greece so as not to alienate any of their allies. When they were besieging Herakleia, King Philippos simultaneously attacked the city of Lamia. The Romans had given their consent for the attack, but when Herakleia had fallen, they nevertheless kindly but firmly asked the king to stop his assault. The king grudgingly complied, and the Roman intervention was appreciated by the Greeks, some of whom were fearful of a new Macedonian hegemony in parts of Greece. However, relations between the Romans and Macedonians quickly deteriorated after the incident with regard to Lamia. An angry Philippos soon began courting the Aetolians in an attempt to turn his enemy’s enemies (who happened to be his own traditional enemies as well) into his friends. The fall of Herakleia prompted the Aetolians to ask for a truce. Glabrio treated an Aetolian delegation with contempt and claimed that he was too busy pillaging Herakleia to speak to them. He still agreed to a ten-day armistice and sent het his legate Lucius Valerius Flaccus with them to Hypata. The main problem was that the Romans demanded a complete surrender of the League. This was called a deditio, and basically entailed that those whose surrendered put themselves at the mercy of the Romans, who could do with them whatever they wanted. The Aetolians had no knowledge of this very Roman concept of surrender and at first accepted. But when the consul demanded that they immediately extradite certain individuals, the Aetolians quickly realised their mistake. A new armistice was agreed so that the Roman demand for an unconditional surrender could be discussed at a formal League meeting. It should not come as a surprise that the demand was rejected. The war would continue. The consul now advanced on Naupaktos, an Aetolian city on the Gulf of Corinth and the League’s most important port. Glabrio began investing the city, but the siege progressed just slowly. The Aetolians were few in numbers, but they excelled at defending fixed positions such as fortresses and cities. In the course of two months, most of Naupaktos was reduced to rubble, but the defenders kept resisting. Flamininus now convinced the consul to give up the siege for the moment. One of the reasons for the former’s intervention was the fact that Flamininus was wary of Macedonian activities. Philippos had for instance in the meantime marched on Demetrias and had captured it without opposition. Glabrio needed to have his hands free if Philippos proved to be trouble, so he offered the Aetolians a truce and asked them to send envoys to Rome to discuss peace terms. Back in Ephesos, Hannibal warned King Antiochos that the Romans would soon cross the sea and invade Asia. The king made sure his fleet was prepared, and in autumn, possibly in September, it fought a battle against a combined Roman-Pergamenian fleet off Cape Korykos, north of Samos. The Roman fleet comprised 105 decked ships and 50 open ships and was commanded by the praetor Gaius Livius Salinator, who had succeeded Aulus Atilius Serranus. 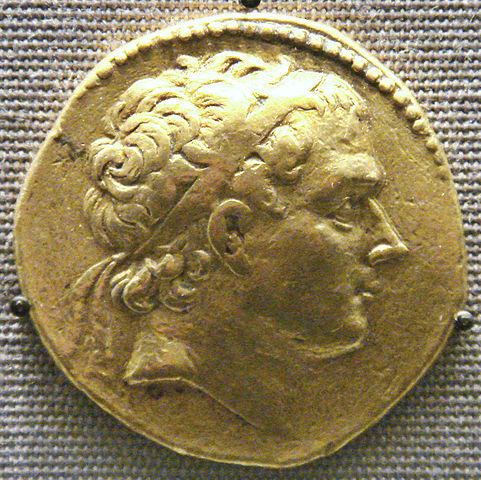 Polyxenidas commanded the Seleucid fleet, which was just 100 ships strong. The battle resulted in a resounding victory for the Romans, who sunk 10 enemy ships and captured 13 more. The victors themselves lost just one ship, a vessel provided by the Carthaginians. 25 Rhodian ships then joined the Romans and Pergamenians and together they chased the remaining enemy ships all the way back to Ephesos. Antiochos had been dealt another blow. With so many of this year’s actions taking place in or near Greece, one would almost forget that there were also events in other parts of the territories now controlled by the Romans. The proconsul Quintus Minucius Thermus continued his campaign against the Ligurians, but suddenly found himself in a difficult position when the tribes attacked his camp. The proconsul managed to keep his nerve and lead a successful counter-attack. The Ligurians were routed and lost some 4.000 men, against 300 casualties for the Romans. Two months later, the consul Publius Cornelius Scipio Nasica won a great victory over the Boii, killing and capturing thousands of them. The victory broke the back of the Celtic resistance and the Boii chose to surrender. Scipio Nasica claimed half their territory as Roman public land (ager publicus), which could be used for founding new colonies. The most important of these colonies would be founded two years later: the city of Bononia, modern Bologna. A priest (gallus) of the Magna Mater and the goddess herself (Museo Ostiense degli Scavi di Ostia Antica). Fully confident that the Senate would award him a triumph for his decisive victory, the consul decided to pick a date for that triumph himself. He sent home his troops and ordered them to assemble again in Rome on the aforementioned date. Several days later, Scipio Nasica was indeed awarded a triumph by the grateful Senate, but a people’s tribune initially wanted to veto this decision. The tribune felt that the consul should first aid the proconsul Minucius Thermus against the Ligurians, who had not been fully defeated yet. Fortunately for the consul, the Senate managed to convince the tribune to withdraw his objections. Scipio Nasica’s triumph was spectacular. It was held in the same year that the Temple of Magna Mater was consecrated. As a young man, Scipio Nasica had travelled to Ostia to receive the sacred rock representing the Great Mother. Now her temple was finally completed. 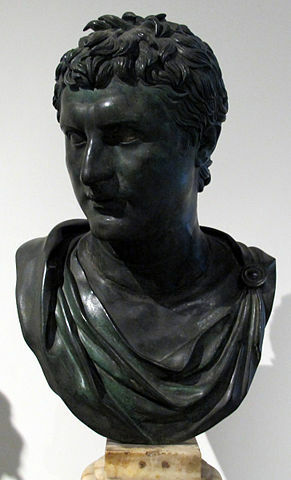 Marcus Fulvius Nobilior returned from his province of Hispania Ulterior this year and was awarded an ovatio for his victories. His successor in Further Spain was Lucius Aemilius Paullus. Paullus was the son of the consul killed at Cannae in 216 BCE. He would go on to win the consulship in 182 BCE and again in 168 BCE. During his second consulship he would defeat King Perseus of Macedonia and end the Macedonian monarchy. Livius, Ab urbe condita, Book 35.24 and 35.41, Book 36 and Book 37.1. The Romans were very well aware of this problem. In fact, a Lex Acilia de intercalando, which allowed intercalations, was passed by the popular assembly this year. The name means ‘fortress’ in Greek. Livius writes that the consul left Rome on 3 May, which is 25 December 192 BCE according to our calendar. The legionaries and allies had been ordered to assemble at Brundisium on 15 May, which is 6 January 191 BCE. It seems likely the consul wanted to cross the Adriatic as quickly as possible. He was to be paraded in Glabrio’s triumph of the next year, but escaped from prison and committed suicide when he was cornered by the Roman guards (Livius 37.46). While preparing his fleet, Livius had been delayed for a while when inhabitants of some coastal Roman colonies (such as Ostia and Antium) refused to serve as sailors (Livius 36.3). Claiming exemption from the duty to serve on the fleet, they appealed to the people’s tribunes. The Senate decided that the colonists were not exempt from service. There had been a similar conflict with the coastal colonies in 207 BCE, during the Second Punic War. Numbers for both fleets can be found in Livius 36.43. The numbers given by Appianus are different: 131 ships in the Roman-Pergamenian fleet and 200 in the Seleucid fleet. According to Livius 36.45; 27 in Appianus’ account.